Artist and teacher. Born in Liverpool, war service 1941-46 with the Inns of Court Regiment, involved in reconnaissance. MacKenzie attended Liverpool Art College 1946-1950. He moved to Cornwall in 1950 and became an active member of the Penwith Society of Arts in St Ives. Between 1951-64 he taught art at Lescudjack School, Penzance, painting in his spare time. His work became increasingly abstract from the mid-1950s, possibly influenced by friendship with Ben Nicholson. He also exhibited at the Redfern Gallery and in 1960 staged a solo show at Durlachers Gallery in New York. He appeared in surveys of contemporary British art such as at Bradford and Plymouth art galleries in 1960. 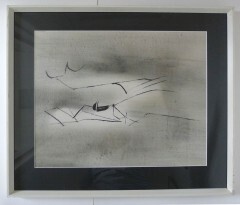 From1959 to 1963 he showed at Waddington’s in London and received critical praise from Herbert Read and Roland Penrose, his work was purchased for the Arts Council collection by Alan Bowness and Lawrence Gowing. He enthusiastically contributed to the development of the Schools Art Collection in the 1960s through his role as a ‘sponsor’. From 1964 to 1984, MacKenzie moved to Trefrize, taught and later became Head of Fine Art at Plymouth College of Art (1972). His last solo show was held at Desmond Austin in 2000.